Oh no, almost a premature tour end! 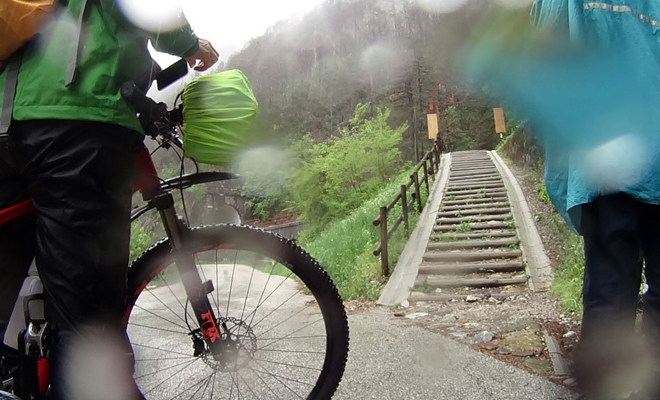 The past few days of the tour were full of little challenges: a stopover at the bike workshop, an elevation gain of 400 metres between Villach to Valbruna and heavy rain pouring down on us on day six – this almost ended this leg of the trip. On the morning that we wanted to start cycling from Valbruna to Venzone it was raining cats and dogs, but we still decided to continue our tour right away since rain was forecast for the entire day. When I went to get my bike from our hotel’s basement, I realised that the battery had not charged overnight, so that we had to delay our tour for another hour while the battery charged. While checking on the battery’s progress we got an unpleasant surprise. The rain had flooded the basement. Fortunately, we had placed the charger on a bag above the water, otherwise, the tour would have come to an end at that very moment. Back on our bikes, we mostly cycled downhill so this part of the tour should have been quite easy. At least that was what we had thought. All of a sudden there were steep ramps and signs that recommended getting off bikes and pushing instead. I am guessing that nobody had tried that with a recumbent bike before. A few metres further on it got even worse. There were only stairs and I would not have managed to get down there alone. Thus, as always, we can only achieve something if we act together – in daily life and in our fight against Parkinson’s. After a restful night in Venzone, we continued our tour through forests and fields to Udine where we were to meet other people with Parkinson’s. At first, we could not find the meeting point, but the local police was already awaiting us. Suddenly, there were two police cars that escorted us to a local museum where we were welcomed by city representatives, local physicians and patient associations. After I had shared my story and exchanged personal experiences with the other people with Parkinson’s, a choir sang for us. Even those severely affected by the disease were singing and clapping along. It is hard to describe how emotional this moment actually was for me. I hope I could show, with my tour and my story, that despite Parkinson’s you can still achieve something in life and that you should never give up. Beautiful cycling trails, majestic mountains, blue rivers, and little streams – that was the scenery we encountered over two days during our tour of Austria. After raiding a bike store for additional clothing to protect us from the hot sun, we cycled towards Sachsenburg. There, we were welcomed by a local journalist who wanted to find out more about the tour and my personal story. It has been fascinating for me to see how many people are interested in my journey, and I hope that this gives other people with Parkinson’s courage not to give up. We cycled from Bischofshofen to a little town called St. Johann in Pongau, where we took the train for a few kilometres to Mallnitz. We had planned this part of the journey in advance, because parts of this route would have been too steep for my recumbent bike. The Alpine stages of the tour have already been quite a challenge for me: going downhill, my bike reached speeds of up to 50km per hour, so I needed to handle the brakes very carefully in order to remain in control. On the next day, it rained for the first time since the start of our tour, but even that could not keep us from cycling onward! We put on our rain jackets and off we went, following the river Drau, which lead us to Villach on the evening of 10 May. The weather forecast looks quite promising for the next days, and I am already excited to meet more people on the road stopping over in Udine, Mestre and Padua. 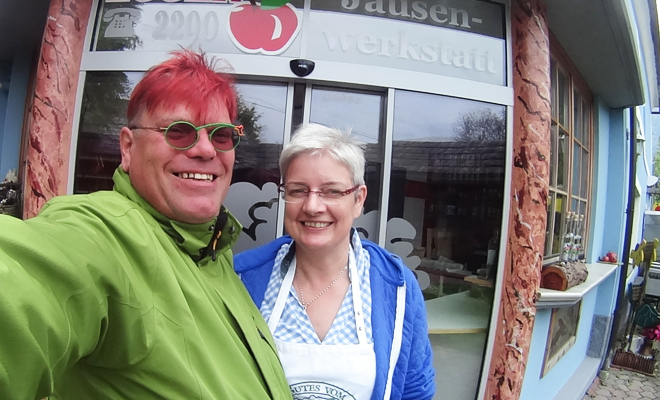 On the first day, we cycled through fields, forests and hills towards the Alps, stopping over at the small German towns Asten and Fridolfing to get some rest prior to the kilometres ahead. My steady companions on this journey are Alexandra Pauler, my osteopath, and Benno Lex, a fellow DBS patient, and we were even joined by a local unicycle group for the first five kilometres. It was a great start to raise awareness for Parkinson’s and DBS and inspiring to see that so many people are following my challenge. After about 65km we reached Freilassing, right by the Austrian border and just across from Salzburg, where a representative of the local patient association welcomed us and showed us around Salzburg the next morning. It was great to meet someone with Parkinson’s from another country and to talk about life with the condition, because although Austria is only 60km away, patient groups are hardly connected between regions. After visiting Salzburg‘s historic centre we got on our bikes again and cycled approximately 70km to Bischofshofen. We are a little sunburned and our muscles are a bit sore, but all is well and we are looking forward to the next part of our tour! At the beginning, there was a vow: “If everything goes well with this surgery, I will cross the Alps by bike and visit my namesake Saint Anthony of Padua.” That’s what Tony Seidl promised himself before undergoing deep brain stimulation (DBS) to treat the worsening symptoms of his Parkinson’s disease. 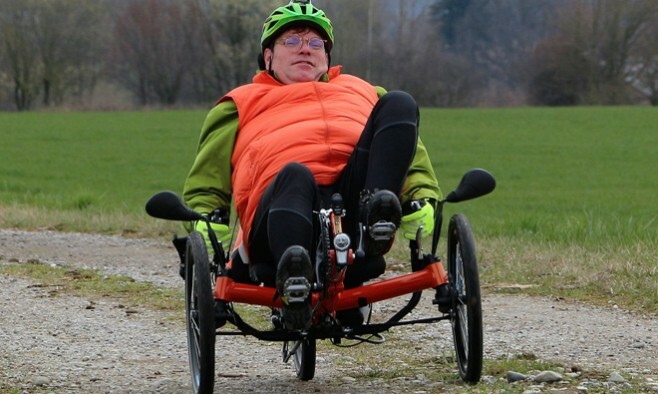 On 7 May, his 50th birthday, at 7am, Tony from Altoetting in Germany will start his 519km bike tour to show other people with Parkinson’s that they can still lead active lifestyles. Taking place exactly two years after his life-changing surgery, this inspirational bike tour is part of the Parkinson’s 100 Challenge, a fundraising initiative by the European Parkinson’s Disease Association (EPDA), aimed at improving the lives of people with Parkinson’s. Starting in his idyllic hometown of Altoetting, situated just at the foot of the Alps and 90km east of Munich, Tony’s extraordinary journey will take him across the mountains to Padua in Italy. Plans for the journey were made more than a year ago and he still can’t believe his dream is finally about to come true. “Now I am finally keeping the promise to myself! I couldn’t be more excited!” Tony says, after months of hard training. When Tony arrived at Altoetting’s Kapellplatz, the central town square, flanked by baroque buildings including the town hall and church, his family, friends and companions from his local patient group were there to cheer him on at the start of his journey and wish him well for his trip of a lifetime. 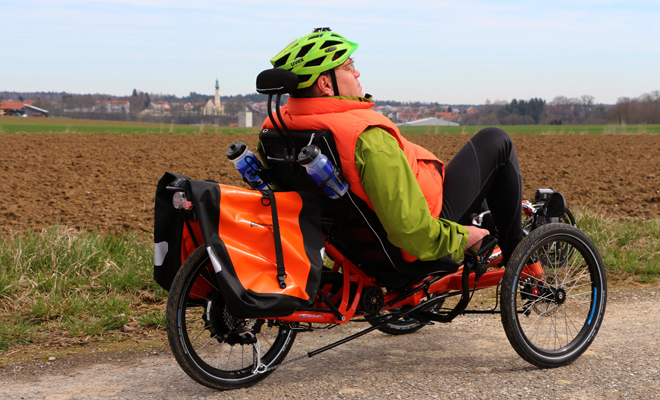 With his recumbent bike that allows him to maintain better balance, he will cycle to Salzburg and along the Alpe-Adria cycle path via Udine and Mestre to Padua. The trip will also serve as an opportunity for Tony to meet and exchange experiences with other people with Parkinson’s along the way. “When I recall the time prior to my surgery, I really missed learning from other patients who had already undergone DBS and could have shared their experience with me. Unfortunately, networking with other DBS patients is still at an early stage,” he says. 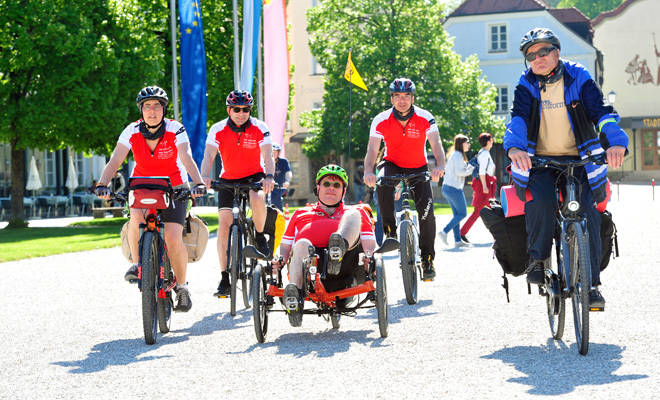 The first stage of the tour leads Tony from southern Germany to the Austrian border, stopping over at Freilassing near Salzburg, where he will meet with members of a local Parkinson’s patient organisations. Further meetings with local organisations and physicians are planned in Salzburg, Udine, Mestre and Padua. “My first day on the road, and what a remarkable and eventful day in my life! I couldn’t be more excited about setting things in motion, starting with myself,” Tony says with a gleaming smile on his face. “Since the surgery I am in much better shape and I am also emotionally stronger in order to reach my big goal.” As a sign of his new courage to face life Tony has dyed his hair red. “The red rose stands for love and the red tulip is also a sign of the Parkinson’s disease movement. Every smile that I receive for my red hair gives me strength and I need friendly faces in my daily life”, he says. Support Tony and find out more about his participation in EPDA’s Parkinson’s 100 Challenge here. Look out for regular updates from Tony’s tour on our Facebook page! Will genetics help us crack the Parkinson's code?